With space at a premium, especially in the kitchen, it’s crucial to invest in experienced, bespoke furniture designers who maximise every inch of your space. At McCarron and Co our designers are used to thinking outside the box to make sure that storage space is utilised in the best way possible. We always take into account your lifestyle and needs as well as the architectural setting, to make sure that the kitchen is practical, functional and beautiful. 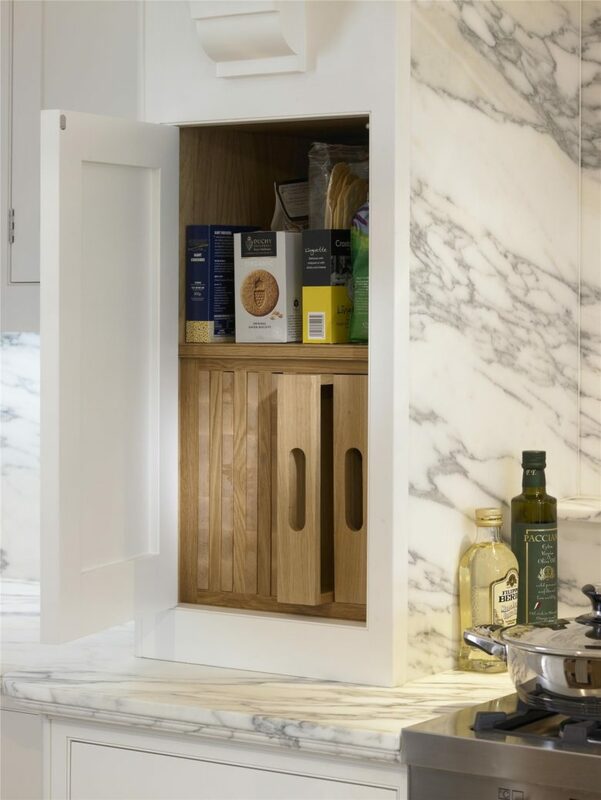 Here, we’ve picked out our top nine McCarron and Co bespoke storage solutions to give you ideas and inspiration for planning your new bespoke luxury kitchen. 1. The end of a kitchen island or breakfast bar is a great space for hiding kitchen essentials such as this knife block and butler’s tray. 2. 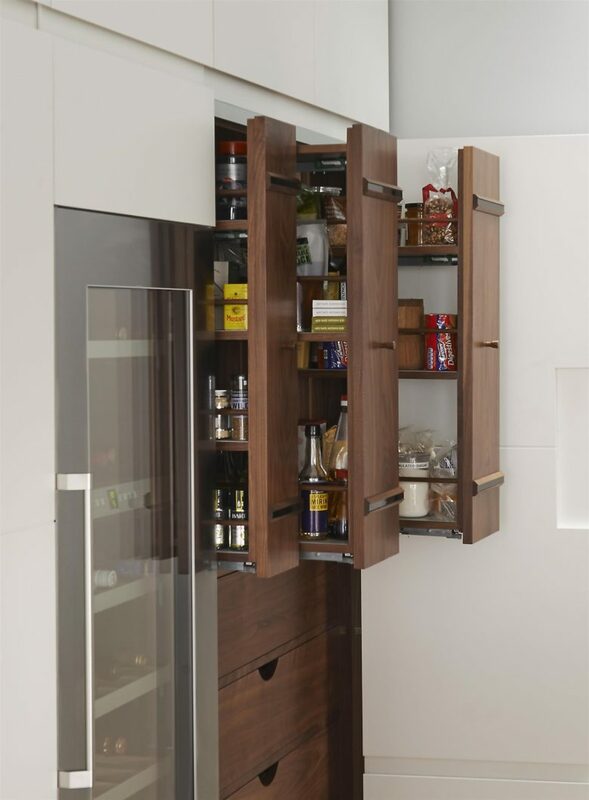 This stunning walnut breakfast cabinet by McCarron and Company enables you to cleverly conceal appliances, storage and worktop space inside an elegant cabinet when they are not in use. When fully opened, it reveals a built-in Miele microwave, coffee machine, sink with a Quooker boiling tap as well as ample storage space for crockery, trays and food storage. 3. Make the most of a narrow-width cabinet by incorporating a pull-out spice rack. 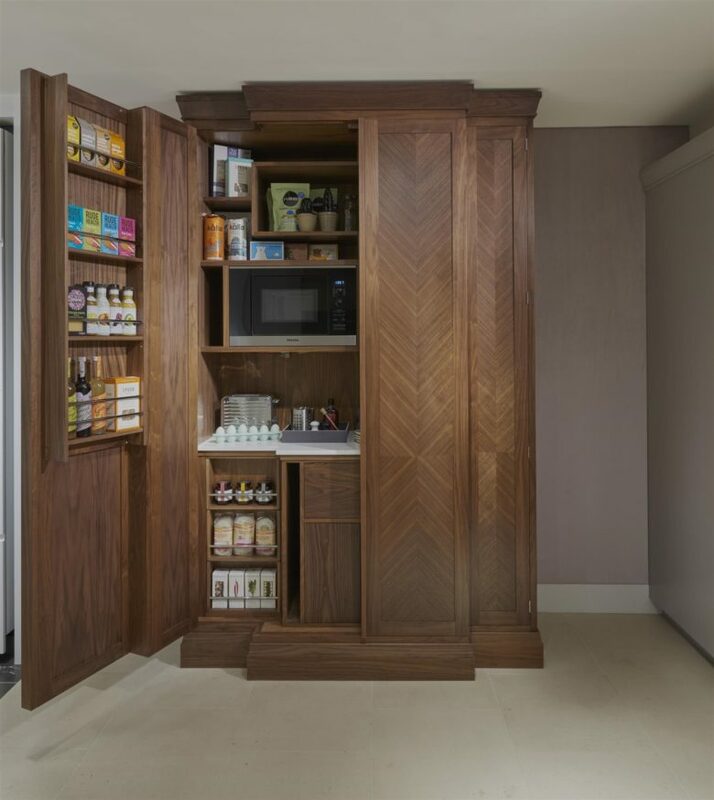 By building the spice rack on to runners, you access those hard-to-reach places, making it so easy and convenient to store spices, jars, tins and other food items . 4. 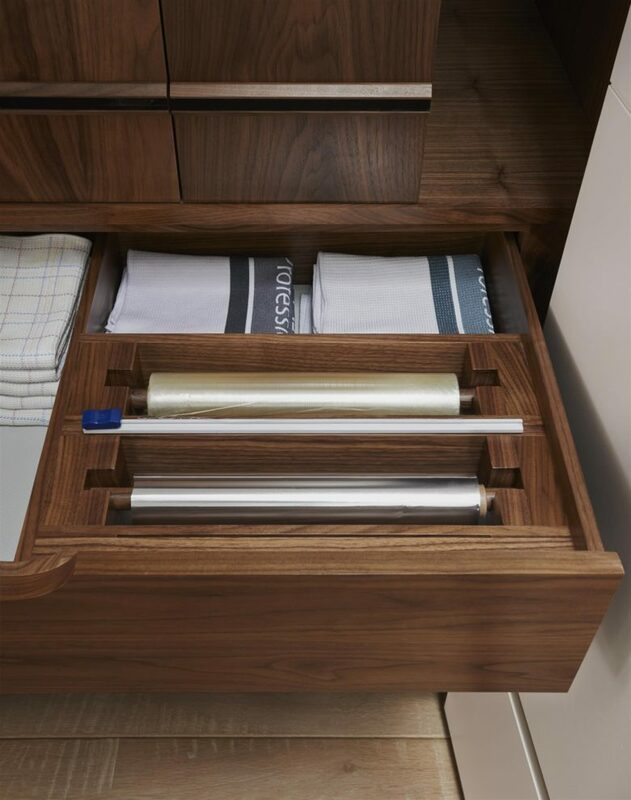 This drawer offers an ingenious solution to storing food wrap and tin foil. It has handy recesses which the rolls can be slotted in to, and a central divider for the cutter. 5. 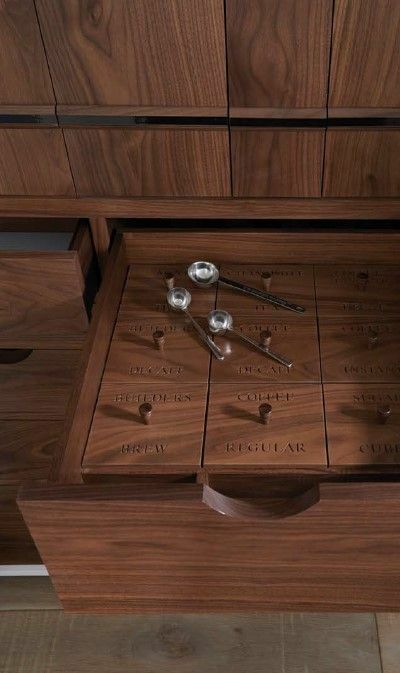 By creating these clever compartments for tea and coffee storage, cupboard clutter is kept to a minimum and everything remains neat and tidy. 6. A secret, panelled door on this traditional mantel-surround offers the perfect place to hide away chopping boards, trays and dry food storage. 7. 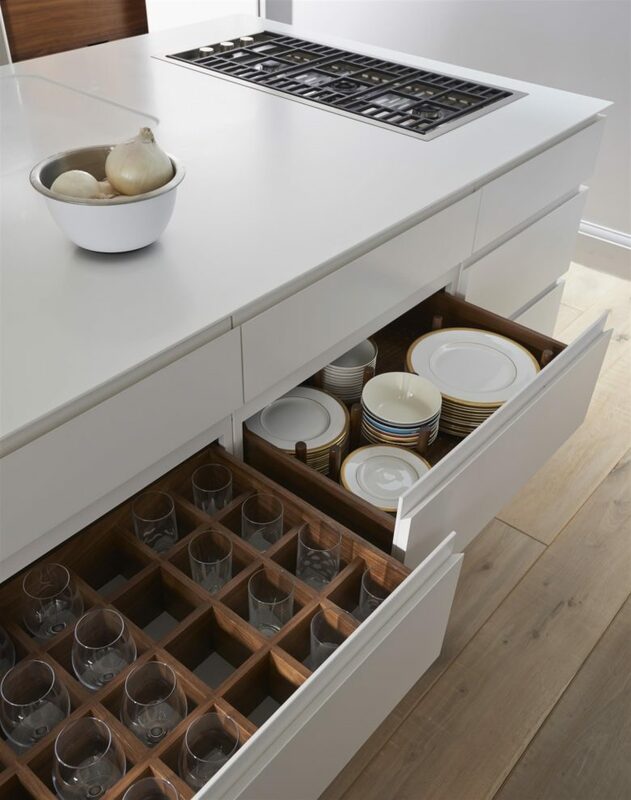 Use deep, pull-out drawers as extra storage for crockery, glasses and cookware. 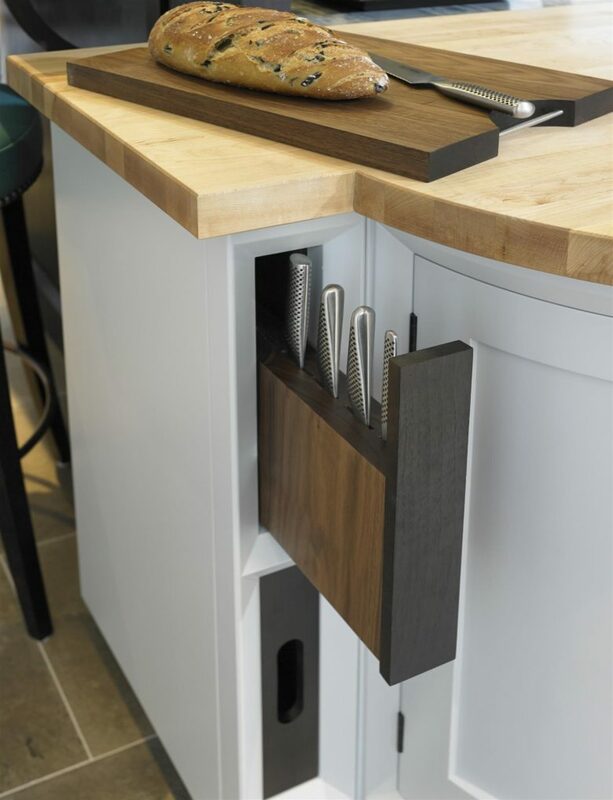 With handy dividers such as these crockery pegs you can create bespoke storage solutions for all your kitchen equipment. 8. 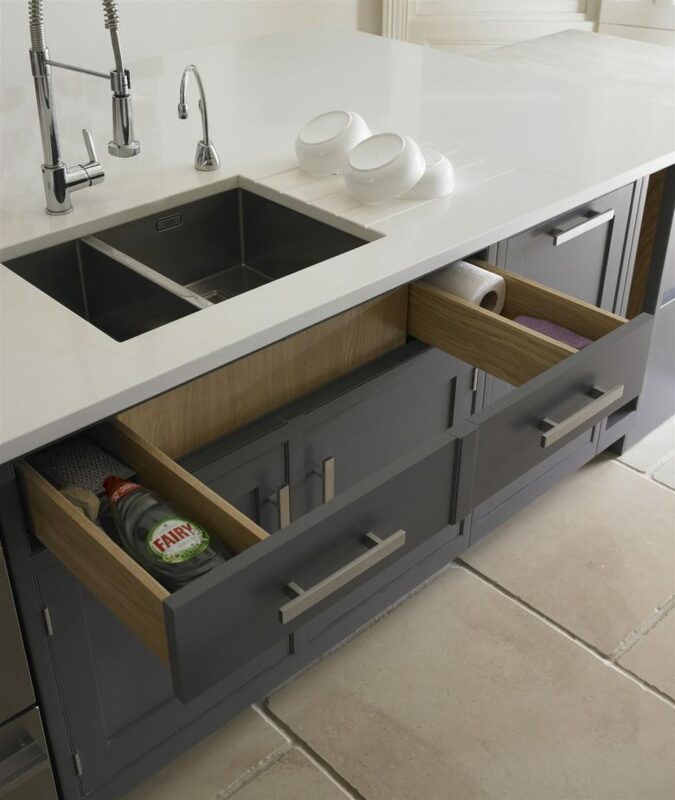 To avoid wasted space beside a sink unit, we made clever use of the space to store washing-up liquid and soaps. 9. 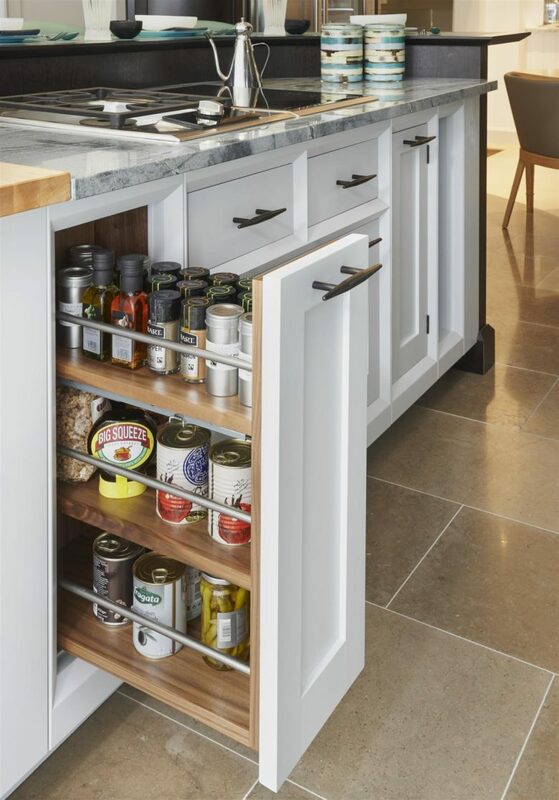 Splitting the inside of this larder into three separate pull-out compartments we ensured that everything was within easy access – no more forgotten tins at the back of the cupboard! For more clever ideas and inspiration, follow our team of bespoke furniture designers on Pinterest, Houzz, Facebook, Twitter and Instagram. To speak with a designer about a project, contact us here or visit McCarron and Co at one of our showrooms.